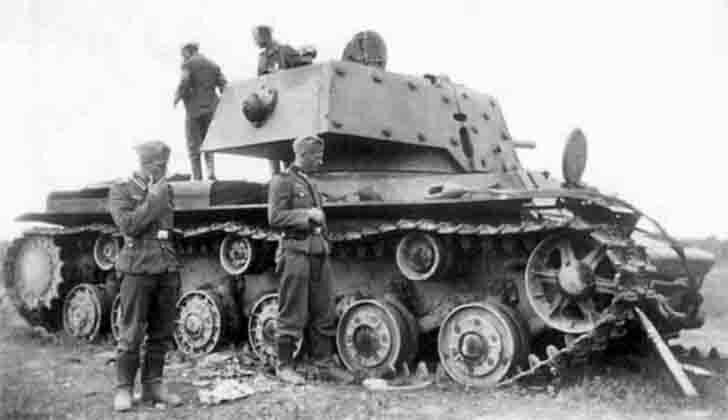 German soldiers inspect the destroyed Soviet KV-1 (“shielded”) heavy tank. Next KV-1 heavy tank is a shell of its 76-mm cannon. KV-1 (Klim Voroshilov) – Soviet heavy tank of World War II. Usually referred to simply as «KV»: a tank was created under the same name, and only later, after the appearance of the KV-2, KV-1 heavy tank of the first models in retrospect was a digital code. KV-1 heavy tank Produced from August 1939 to August 1942. KV-1 heavy tank took part in the war with Finland and the Great Patriotic War.